Published on December 5, 2008 in Other Beers. 0 Comments Tags: coffee, na, non-alcoholic, O'Douls. Your options for non-alcoholic beer are very limited. You either get a lager that tastes like nothing, a lager that has oxidized and is skunked, or you get one of two pseudo ales. First is Kaliber. It is wretched. 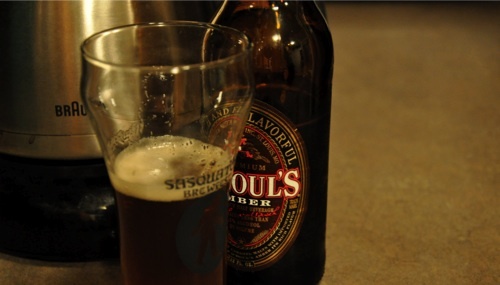 Moving on, you have O’Douls Amber, my wife’s choice (and mine) among NA beers. But after a while, even the best NA beer really gets old. The “maltiness” is too sweet so you desperately try to make it a little more balanced by adding hop oil. However, this is easy to overdo, and sometime you need a non-hoppy malternative. Enter Coffee Brew. Take roughly 1/2 to 1 oz of cooled decaf coffee and add to 6 oz of O’Douls Amber. You may need to adjust the ratio to your taste, but it’s a decent option for dark, cold winter nights when a skunked lager won’t cut it.